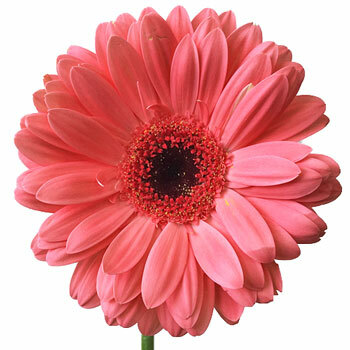 Step into your wedding dress and fall into fashion with this beautiful Coral gerber daisy. The exceptional, provocative color of this flower is one of the hottest wedding colors right now. If you’re looking to design haute wedding bouquets and centerpieces then pair this beautiful flower with coral peonies, Jam tart Sweetheart garden roses and FiftyFlowers textured mixed greenery box. Light eyes can range from yellow to green in color and Dark Eyes can range from Burgundy Brown to Black. We cannot guarantee the exact center color of this flower. You may also receive a mix of center colors in a single pack. Gerberas may arrive with straws on their stems. These are to help keep the flower straight during the hydration process. Keep these straws on until you are ready to arrange your flowers.